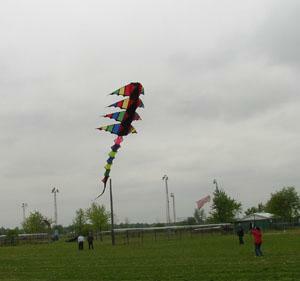 The Essex Kite Flyers held the Andrew Baxter Memorial Kite Fly for the Make-A-Wish Foundation® of Southwestern Ontario on May 15th at CoAn Park in McGregor. 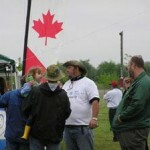 The Make-A-Wish Foundation® grants the wishes of children with life-threatening illnesses to enrich the human experience with hope, strength, and joy… Approximately 200 people came to support this worthwhile cause, along with 26 registered kite flyers representing 8 different kite clubs across Southwestern Ontario, Michigan and Ohio. 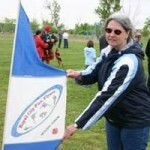 Represented were, Essex Kite Flyers, Royal City Fun Flyers, Guelph, The Renegade Strings, Mannhiem, Ontario, Niagara Windriders, Port Colborne Ontario, Kitchener-Waterloo Wind Climbers, Toronto Kite Flyers, Black Swamp Air Force of Ohio and the Bandana Gang. 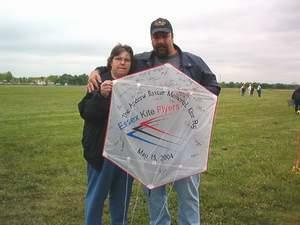 On June 6, 2004, the members of the Essex Kite Flyers met with representatives of the Make-A-Wish Foundation® of Southwestern Ontario to present them with a cheque in the amount of $4113.80, from monies raised from a charity fundraiser. The funds were raised from corporate and private donations, pop and hot dog sales, raffles and a silent auction. They were sponsored by Unions and service clubs and received contributions by several businesses and individuals. 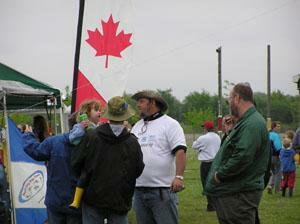 All Auction and raffle items were donated as well as soft drinks, food, special events trailer, and sound systems. 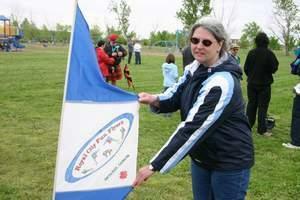 Trophys, donated by Doug Rounding of the Essex Kite Flyers, were handed out to specific individuals. Jessica Jonkman St. Dennis for youngest flyer,3, Louis Letwin for the oldest, 67, Adrian Conn of Windsor the Charlie Brown award for the best kite crash, Bob White of the Niagara Windriders for the farthest travelled. The Most Improved Flyer Award went to 10 year old Bill Osmon of Chatham. 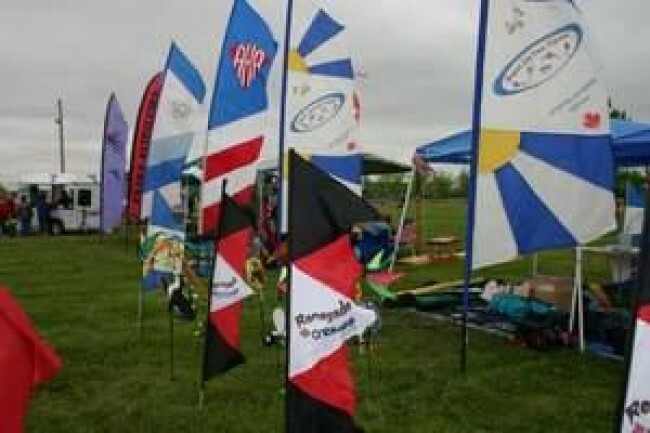 Best Ground Display went to the Royal City Fun Flyers of Guelph and the Best Line Laundry went to Eric Curtis of Boreal Kites in St. Thomas. The Essex Kite Flyers hosted their first ever “Fighter Kite Round Robin Tournament” Participants were, Terry “McKite” McPherson, Ken “Mr. Mustachio” Van Der Kolk, Carl “Gumby” Anderson, Larry “The Wizard” Green, Karen “The Evil Sorceress” Green,(The name suits her well) and Rick “Albatross” Longhurst. First place honors went to Carl Anderson, who, had a flawless afternoon of fighting. Second was Terry McPherson and third to Ken VanDerKolk. 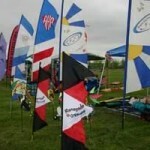 The Windjammers Stunt Kite Team of Michigan was given the Honorary Membership Award for their Contributions to the world of kiting. 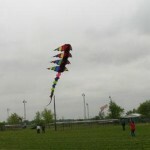 Adrian Conn Launched his immortal kite “Genesis” which was a thrill to all. 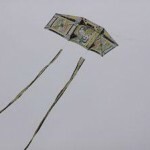 Jeff Donde of London Ontario brought his usual (or unusual) collection of kites which included a 100 kite Yakko Stack and members of the Royal City Fun Flyers held a para bear drop for the kids at the event. 46 bears were given away to the children. Over 40 sponsors and contributors helped us pass our goal of $1500 by $2600. The Windjammers Stunt Kite Team was awarded with this years Honorary Membership for work in the kiting community and being such great ambassadors for our great sport. A special Rokkaku was built by Larry and Karen Green of EKF and presented to Tim and Denise Baxter, parents of Andrew Baxter, after the Mass Ascension. The M.A. was flown to the tune of Amazing Grace. The Baxter’s Rok was launched as the single pipe started the Ascension . 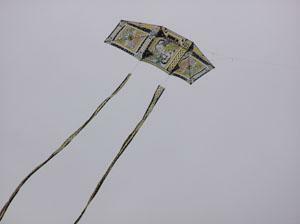 When the Mass Pipes and Drums entered, 30 – 35 more kites joined the Baxter’s kite in the sky. 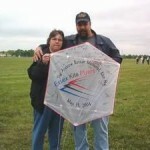 The kite was then signed by all registered flyers and given to the Baxters as a memento of the event. The Guelph club also held a ParaBear Drop, where the dropped teddy bears with Parachutes from a kite to the delight of the children in attendance. Plans for next years fundraiser is in the works and the public will be notified. The Essex Kite Flyers would like at this time to thank everyone who donated to our cause and ensure them, we could not have done this with out them, and to the citizens of Essex County and surrounding areas for their support. The Executive of the Essex Kite Flyers would also like to thank all of our members who worked so very hard through many long hours to make this event such a success. Photos of the event and a full list of contributors can be found on our website. This entry was posted in 2004, Events / Festivals, Issue 37 (Jul/Aug), KL Archive, Reports and tagged festival, make a wish.